EVIL MASQUERADE will celebrate their 10th Anniversary in December 2014. 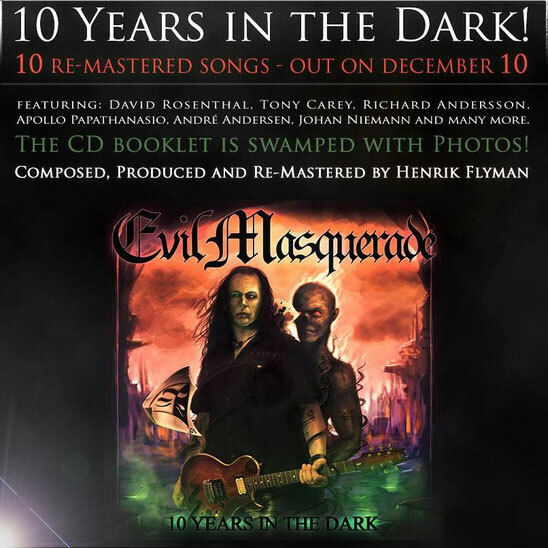 To mark the anniversary they will release the album entitled "10 Years In The Dark" on December 10th. It's a CD with 10 digitally remastered tracks from the period of 2004-2014 and a booklet that is filled to the brim with photos. All songs are composed, produced and remastered by Henrik Flyman. This special album features great musicians such as David Rosenthal, Tony Carey, Apollo Papathanasio, Richard Andersson, André Andersen, Johan Niemann and many more. 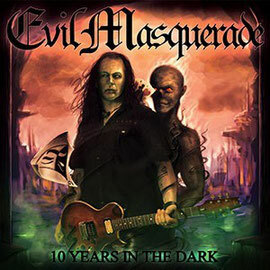 Pre-order is now available on their website http://www.evilmasquerade.com/shop/ with the 10th Anniversary price €10. Order before the release date and you can choose to get the album signed by Henrik Flyman. All pre-orders will be sent out a few days in advance of the release date.